Since the price of new cars is so high – and usually requires taking on a substantial amount of debt – you may be interested in buying a used car instead. 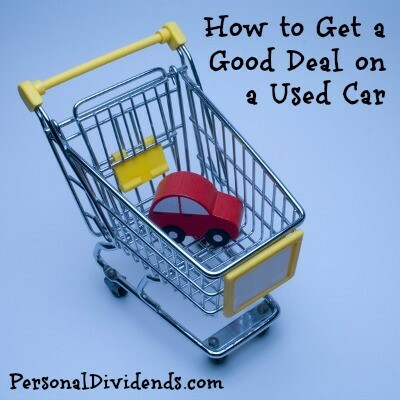 How can you get a good deal on a used car? It’s often tempting to go to a used car dealer, or the used car lot at a new dealer, to look for a car. In a way, it makes sense. After all, since dealers have a lot of cars on their lots, you have a lot more selection to choose from. Still, dealerships are not the best place to get a good deal on a used car. For one, they add a substantial profit to the purchase price that you will pay for the car. For another, they’re sales organizations fully skilled in the art of getting maximum price for whatever it is they’re selling. If you want to get a good deal on a used car it will be best to deal directly with the seller of the car. This will require more investigation and more legwork on your part, but you can save hundreds and even thousands of dollars if you do. The seller is just looking to sell the car – profit doesn’t enter into the picture. The biggest mistake people make when buying a used car is paying too much for it. They assume that whatever the seller is asking is approximately the real value of the car. Sometimes that’s true, but sometimes it’s not. You need to be prepared in either case. Before even making an offer on any car, first check out the value of the car on automotive websites, such as Kelly Blue Book and Edmunds.com. They have valuation tools that will allow you to get a reasonable approximation of the true value of the car. You will need to enter the basic information, such as the year, make and model of the vehicle. But you will also need to get more specific, by including the mileage, the major options, and the overall condition of the car. Since condition is totally subjective, it’s always best to estimate on the low side. For example, if you believe the car is in average condition, list it as below average condition. Make an offer only when you have a solid idea what the vehicle is worth. This is so obvious that it shouldn’t even be listed, however some people actually buy cars sight unseen. But make sure you test drive the car, and while you do pay attention to everything – the way the car shifts, the lights and windows, the heating and air conditioner, the condition of the entire interior of the car, the breaks, and how it handles overall. Most important, listen carefully to the sound of the engine. This will give you clues as to how long the car will last. If the car purrs like a kitten, the engine is likely to be in good shape, and the car will last a long time. If it’s making unexplained sounds, it can be an indication of major repair bills down the road. Be sure to listen to the engine while you are driving the car, and also while it is parked and idling. If you have any doubts about the operability of the car, have it checked out by a a trusted mechanic before making an offer on it. You’ll have to pay the mechanic to perform the service, but it could prove to be money well spent. Either there will be major problems that will allow you to negotiate a lower price (or walk away from the deal), or you will know that you have a good car. When you deal with an individual car seller, there is no sales infrastructure the way it exists at a car dealership. You will need to agree to terms with the seller, as well as come up with your own financing if necessary. The more cumbersome this process is on your side, the more likely the seller will be to choose to sell the car to someone else. You should try to be as close to an all-cash buyer as possible. Cash represents a clean transaction, that will involve less paperwork and no waiting. That not only means having your cash available, but also having financing lined up and approved before you even make the offer. If you do have to take the loan, you have to make the process as quick and smooth as possible. Being a strong buyer will also give you negotiating points in buying the car. If the seller senses that there is a financial problem on your part, he may choose to either not sell the car to you, or to play hardball on the price. Whenever you make important purchase, you must do it from a position of strength. Nowhere is this more true than when you are buying a car.